Kohl was staying at a Petco store, which is often what rescue groups do to help the animals get adopted, when we went to go meet him for the first time. It was definitely a rough start because he was, understandably, completely terrified of us. He kept hiding behind this cabinet in the store and the majority of our time with him was spent trying to get him out. But I worried that if we didn’t take him home that day, it’s possible that no one else would adopt him because of his introverted personality. As a fellow introvert, my heart just instantly connected with him on that level so we bought him a littler box and food and took him home that night. The drive home was equally sad and hilarious because he just kept hiding in the car. He spent the majority of the drive under my seat and the struggle to get him into our apartment was very real but we did it! And then he spent the next few hours running around and exploring his new home. He was still really afraid of us and would run away whenever we tried to get somewhat close to him. A good friend of mine is a total cat mom and I’d spent the entire time we were meeting him/bringing him home on the phone with her. She reassured my neurotic self that this was entirely normal behavior and that we should let him come to us at his own pace. I spent that evening researching ‘how to raise a kitten’ online and felt really overwhelmed. Kohl then proceeded to poop on our bean bag (that no one sat on anyway) and that just kind of put me over the edge. I thought we’d made a mistake and that he’d never like being with us and all other dramatic thoughts you can think of. But then just as we were about to go to bed, my husband picked him up and started petting him. And to my surprise, he started purring and didn’t run away!! He fell asleep on him and then I was completely in love and knew that everything would work out just fine. Kohl has been a part of our family for about 3 weeks now and I honestly can’t imagine life without him. I’ve been struggling with school a lot and having him around has truly been such a blessing. He does the goofiest things and always makes me laugh. He’s always ready to play, no matter what may be wrong in the world. And there’s just something about having a purring kitten on your lap that makes you feel like everything is going to be okay. Litter box – Ours is very similar to this one. I think basically anything with a lid is really great because it keeps the smells inside for the most part and if you end up taking the kitten somewhere, it’s easy to take with you. Kennel – We have this exact one and really like it so far! We got a plastic one because it’ll be a lot easier to clean up if he ever has an accident in it. And the top loading option will be really great if he ever starts really hating going in it because you can essentially ‘drop’ the kitten inside. 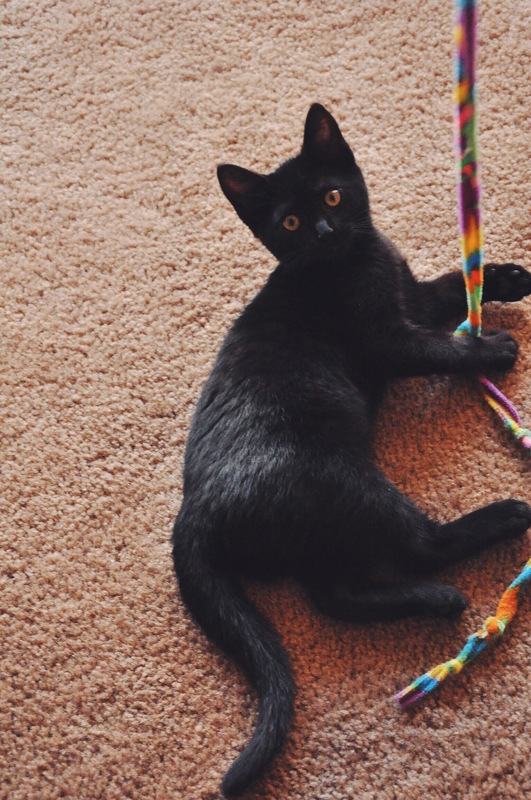 Food – We’re currently using the Wellness kitten formula and he’s been okay with it so far! He prefers trying to eat our food heh but he’s growing very quickly so it’s getting the job done. We’re looking into getting him some treats and some wet food so that he’ll stop trying to eat ours.